This trip is now fully booked. Contact us to enquire out our waiting list. Join us for a week of guided and catered skiing out of Mount Carlyle Lodge. We will helicopter in to the lodge on Sunday February 24th, 2019 and fly back out the following Sunday, March 3rd. During our stay we will have two ACMG certified Mountain Guides leading the groups on day trips from the hut each day. Each evening we will return to the lodge to enjoy the sauna followed by a delicious meal prepared by the cook. Sitting at 2,200 metres (7,200 ft) on a small sub-alpine knoll, Mount Carlyle Lodge enjoys grand views of high summits, nearby ice fields and the deep wild valleys of B.C.’s Kokanee Range. In the winter, Carlyle provides exceptional access to an endless variety of awesome backcountry skiing and snowboarding options. If you are flying from out of town the most convenient international airport is Castlegar, a 2 hour drive away. However, be forewarned that it has the nickname “Cancelgar” for a reason. Creston is a lot more reliable, and not much further away (2h30). Either way you’ll need to rent a car to get to Kaslo. If you’re driving in from Vancouver it’s about a 9h30 drive whether you route through Revelstoke (Hwy 1), Kelowna, or Hwy 3. From Calgary it’s about 8 hours whether via the Trans Canada or via the southern route (the south route avoids the possibility of a road closure through Rogers Pass). Let’s have dinner together at the Taqueria El Corazon at 7:00 pm on Saturday night (click for Google Maps). At that time we’ll discuss the logistics of the next day in detail. Stay in Kaslo Saturday night. Here’s a list of suggested accommodation. Reservations highly recommended! The main thing to know being that we will meet at the heliport at the north end of the Kaslo Airport. Meeting time Sunday morning is 8:30 a.m.
BEST BE ON TIME: Your being late effects over 2 dozen folks and equipment. However, if for some unforeseen reason (better be a good reason ) Contact Highland helicopters (250-265-3434) by 8:00am if you will not be arriving to the helicopter staging area on time. If you do end up missing the flight, all is not lost — we’ll get you there — but it will cost you a substantial additional fee ($500 or more) for a charter flight into the lodge. Coming from Nelson: drive 1 km past the Esso Gas Station in Kaslo, (on your right), and turn LEFT onto Balfour Ave.
Coming from Kaslo: drive towards Nelson, at the crest of the first large hill; turn RIGHT onto Balfour Avenue towards the airport. After turning onto Balfour Avenue stay on this main road without turning left or right for 3 km. You will be driving past a few airplane hangers on your left after a small hill. The KMH helicopter staging location is at the very end of the airstrip on the left. Once you arrive, you will meet a KMH representative who will start organizing things for the helicopter flights in. Please use our Online Registration Form before proceeding with any payment. It’s a two-step process, requiring you to read through and sign the waiver first, and then collects your personal information securely. If you have any questions or do not understand anything to do with the waiver or application form please contact me at twolfe@sawback.com asap. Mount Carlyle asks you to sign an additional waiver upon arrival, this is found here. Please take the time to look through it, read it, and understand it before proceeding with your registration. The fee for the week is $2775 CAD + 5% GST, or at a discounted rate of $2575 + 5% GST for ACC Vancouver Section Members. A $500 deposit to secure your place is due upon booking. Final payment of the balance is due by September 15th, 2018. You will be invoiced for your payments after you have confirmed your interest in the trip. Please note that initial deposits are absolutely non-refundable, and final payments are non-refundable after the September 15th payment deadline. Get your cancellation insurance if you’re at all worried about our strict cancellation policy! 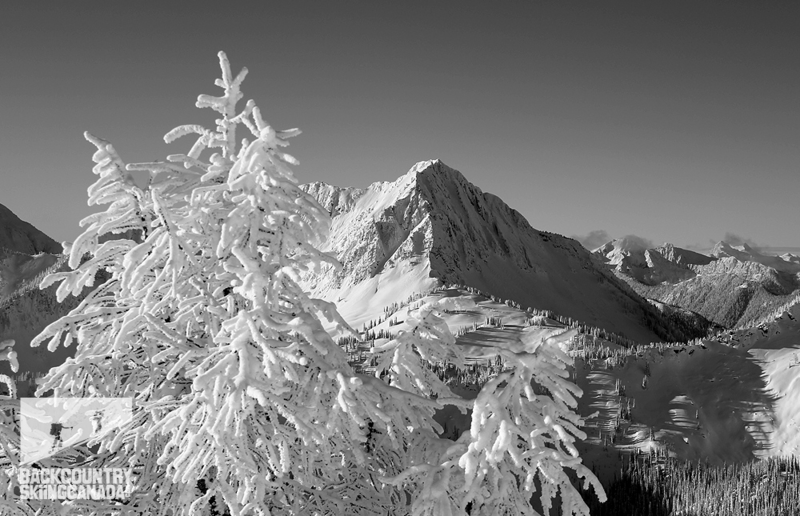 Mount Carlyle is in the heart of the Kootenay’s, BC’s snowbelt. Expect a lot of snow. Late February temperatures could range anywhere from -20°C to +5°C though so come prepared for anything! Pack your “stuff” directly into your ski pack and a small to medium sized duffle bag, 60 litres max. Please avoid using the large duffle bags/packs and anything with wheels or hard sides, as they are awkward to handle and difficult to load into the helicopter. We do not provide any alcoholic beverages, however you are welcome to bring some along with you. Bring beer in cans. Small kegs are fine – no giants. We suggest that you pack your alcohol separately from your duffle to avoid any possible spills during transport. We supply all linen and quilts so you don’t need a sleeping bag. Please bring a towel for the sauna. Skis are best strapped together with your poles but please leave ski bags behind for the flight into the lodge. Shovels and probes should be inside your ski pack both for the flight and for day to day ski touring. Everyone is advised to dress for skiing when they get on the helicopter so you should have your ski boots on and all other footwear packed safely in your duffle bags. It’s too easy to lose a single boot in all the powder that will be blowing around and you want to start out with dry feet. Bedding: We supply all bedding. Carlyle also supplies: All toilet paper and soaps for dishes, general hygiene, shampoo etc. Workshop: There are ample tools for any necessary equipment repairs. Tunes: There is a BOSE Bluetooth player ( no batteries needed). Power: We have ample power so you can power your chargers for your, radios, cameras and headlamps, etc. We have a generator which we will run as necessary in the evenings. In the name of conservation we try to organize as much charging as possible at one time. Bring a quick charger for batteries if possible. Carlyle Repeater: Rx: 164.565 CTSS Tone 110.9 Tx: 168.585 CTSS Tone 110.9. BOTH Receive and transmit are WIDEBAND. Want to know more? Click here for even more info on the lodge. Photos of this trip’s guides can be found on our Guides and Partners page. Tom Wolfe (Mountain Guide ACMG/IFMGA) has been guiding since moving to Canmore in 1995, the place he calls home with wife, son and daughter. He guides year around, with winters being a mix of ski guiding at lodges, heli-ski operations, and remote backcountry destinations throughout western Canada. Conrad Janzen (Mountain Guide ACMG/IFMGA) has been guiding mountain adventures throughout the mountains of Western Canada since 1998 and lives in Harvie Heights with his wife. He currently splits his time between mountain guiding and working for Parks Canada on the Visitor Safety team based out of Lake Louise. Finally, your week at Carlyle includes superb meals. These are prepared by Carlyle’s in-house chef who consistently amaze guests with her beautiful, tasty, and abundant food. We are happy to accommodate special diets as needed (additional fee applies). 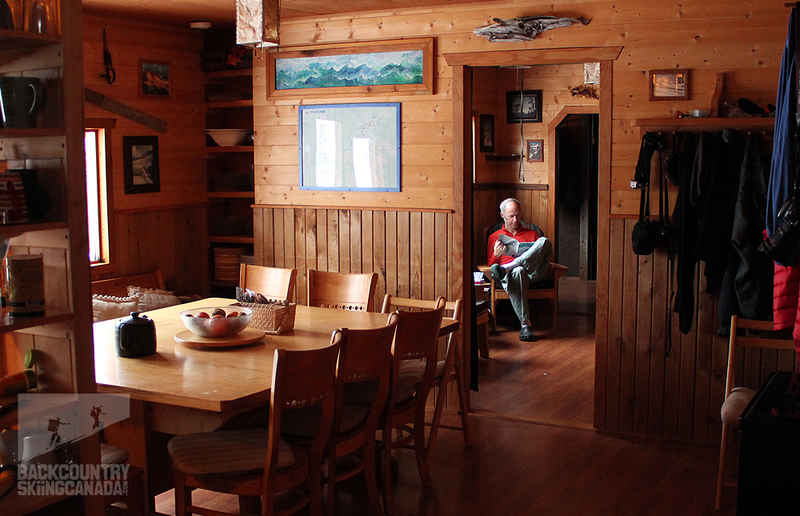 Our goal is to provide you with the best skiing possible from the comfort and ease of a fully catered backcountry chalet.